Degas Ballerina Wendy Ann Felt is a wonderfully whimsical doll. 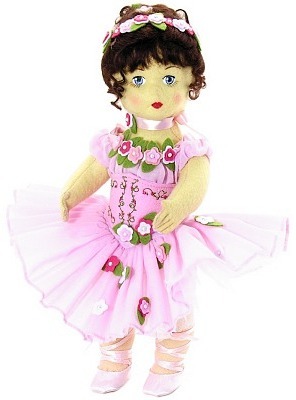 Brown mohair upswept in curls are the canvas for pink and green flowers that are just like the ones on her pink "tutu" and the pink satin choker that encircles her neck. The pink organdy dress, featuring an off the shoulder bodice with puffed sleeves, has a delightful corset like treatment at the waist and a cascade of pink felt flowers flowing down her ballet dress. Adding frill to the tutu is an underskirt of white net, pink tulle and pink organdy. Pink ballet slippers and Lycra pantyhose complete this doll who is definitely a keeper. Limited Edition of 400 dolls. Retired item - available for limited time.